What is true balance? XII, The Tree (Hanged One). True balance is letting go, surrendering to process, a willingness to adopt an alternative perspective. For what bounteous gifts are we to be grateful this year? XIII, Death. Endings that led us to renewal, our capacity to transform, the gift of the truth of impermanence. To what deep place are we journeying this autumn? Child of Earth. We’re journeying to a place of tactile connection, the realm of awe of the body, Earth, nature, food, basic sustenance. How can we prepare for this deep, connective journey in a good way? X, The Wheel. 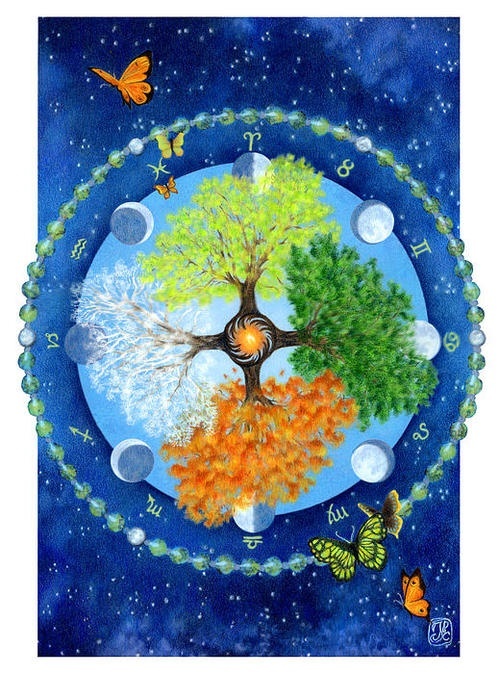 Create and employ a centring practice as we observe and experience organic seasonal changes. Remember that as beings who are part of nature, our own cycles and seasons of sadness and joy, having less and having enough, sleeping and waking, intimacy and autonomy, etc. are perfectly OK, so move with them. I give thanks and extinguish the candle as I wish all of you a blessed Equinox.